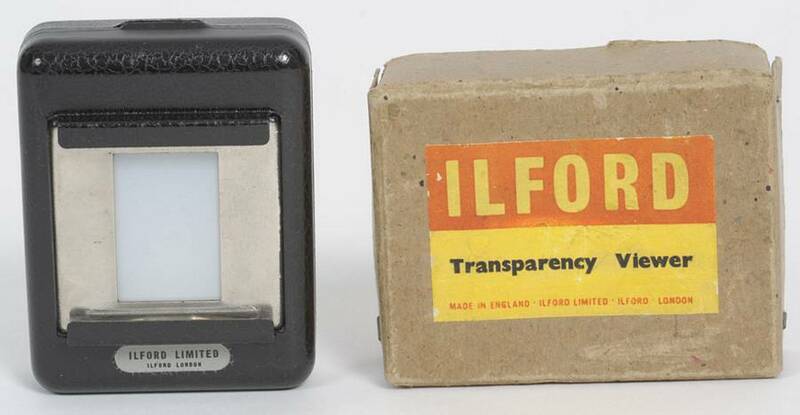 The Ilford Transparency Viewer was advertised within Ilford literature in the early 1950s. Described as a "pocket-size viewer using Ever Ready No.8 or Drydex No.2 T.10 dry cells and providing an excellent method of showing colour transparencies. Inserting the slide automatically switches on the light. Finished in black crackle cellulose. Transparencies mounted in either cardboard or metal mounts may be used. Supplied with bulb but without batteries, price 15s" (75p). The Ever Ready No.8 battery was a 3volt dual cell battery measuring 21.8mm diameter by 74.6mm tall. Their modern day equivalents are still available e.g. here. For size comparison, a 1.5volt AA cell (as are commonly used today) measures 14.5mm diameter by 50.5mm tall.